WarriorQuest: Search WarriorCat (books, videos, etc. ), plus journal articles, newspapers, streamed media, and most library databases. WarriorCat: Search books, ebooks, videos, and other resources. Journal Search: Search peer-reviewed journal articles. Saturday, April 20, 2019 11:00am - 1:00pm ProQuest Ebook Central will not be available due to a scheduled maintenance during this time. Would you like to gain experience working with elementary students? We need a Federal Work Study college student on Monday-Thursday evenings, from 5-7 pm. This position also has the option to work summer morning hours, starting in June. Please apply here. If you have questions, please contact the library or HR for more information. 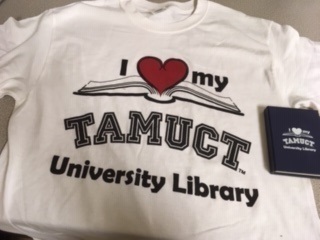 Take the Annual Library Survey and get a TAMUCT Library t-Shirt or book of post-it notes and flags! Everybody loves our t-shirts, so hurry before supplies are gone! Print out the acknowledgement page and bring to the circulation desk for your t-shirt. 4/1/19: T-shirts gone, but we have more post-it books! Welcome to the University Library! We are happy to help you with research projects, class assignments, or any other questions you might have. Please let us know what we can do to make your University experience a little more pleasant, or a lot easier. We have approximately 200 databases with over 66,000 electronic journals and 430,000 print and ebook titles. We also have librarians on duty in person whenever the library is open, and 24 hours a day, 7 days a week online. If you need anything, let us know! Need More Information? Call (254) 519-5798 or email library@tamuct.edu. Library Account: Material renewals, holds & checkouts. NOTE: Not database login. E-Reserves: Assigned content for courses requested by TAMUCT Faculty and provided by the library. Journal Title Search: Search the library's full-text journal and e-book holdings by title. SMS Messaging: Sign up for text messages when your items are overdue, and renew by text! Circulation Guidelines: Find out about the services offered through our circulation desk. Find a Research Guide by Subject: Class and subject Research Guides. Schedule an Appointment: Send a request to meet with a librarian one-on-one, in-person at either location, or using Skype. Interlibrary Loan: Access your Interlibrary Loan Account or request new ILL items. University Archives: Information about resources available through the University Archives. Digital Archives: Meeting minutes, agendas, and other documentation from the University, as well as local history. Copyright Guide: Examines fair use in education and research, creating and using instructional materials, and the use of film and video in a classroom. Thesis Office: Find the Thesis Manual; templates, forms and style guides; and additional resources. EBSCO Host Description of this database.